After a bit rushed couple of weeks when we moved from place to place every two to three days we really longed for a quiet place to relax. 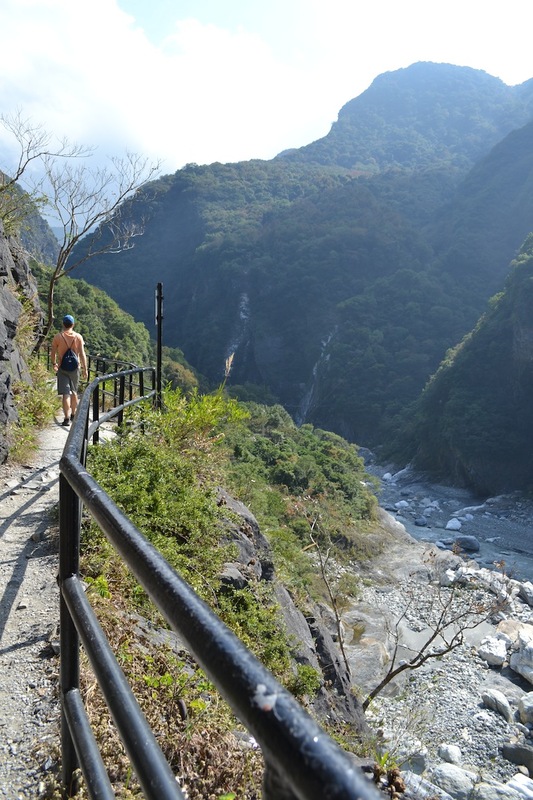 As recommended by many we decided to make our way down from Taipei along the island’s east coast to wonderful Taroko National Park. 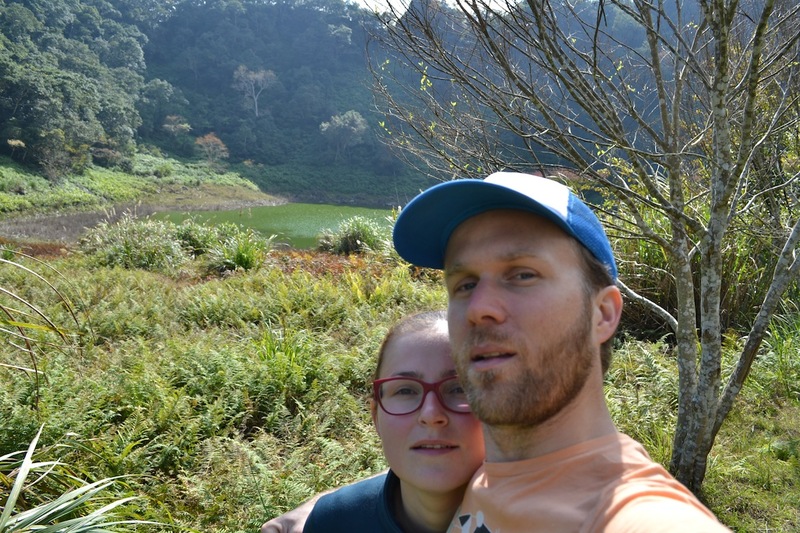 We were looking forward to marble walled canyons, rich vegetation, monkeys and some pretty high rocky mountains. 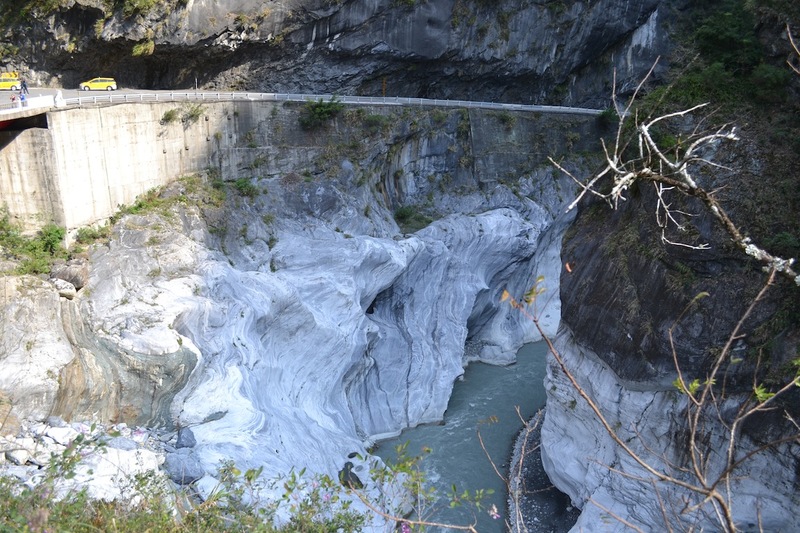 Before reaching the gorge we made a one-night stop in a city of Hualien, that is commonly used as a base for Taroko day trips. We stayed in a homely guesthouse called Chaofu B&B, not far from the train station, where we were welcomed by the owner with water, biscuits and bananas! Later on we also got some more water, oranges and fancy cookies. Thats what we call hospitality! 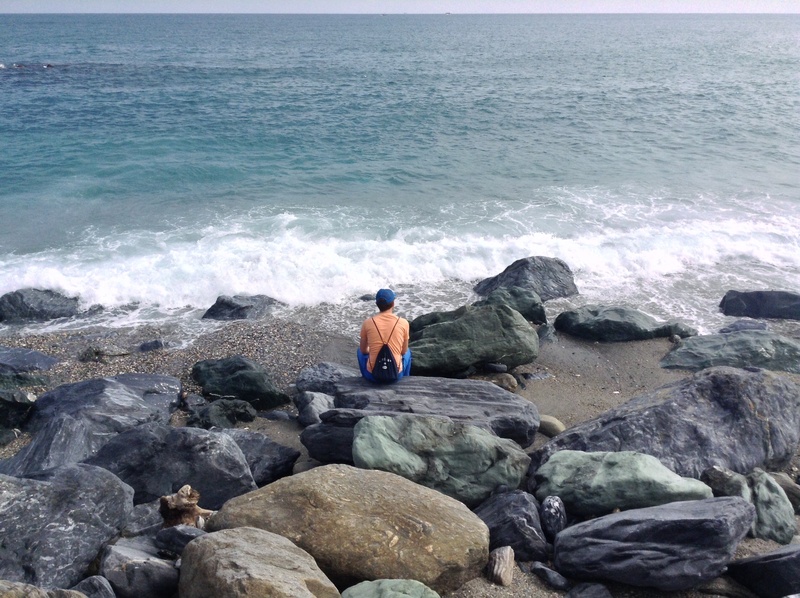 The day in Hualien was a short one, but along with the sweet treats we were also given 2 bicycles for the day and so we had a chance to explore the coast with its wonderful bike trails. Fantastic conditions, thourough signposting and lovely scenery made us wonder how Taiwan does it. We had a break at a port where old warehouses were turned into art galleries / cafes and sent some local art postcards. When we write this, we know that the ones we sent to Slovakia reached there in 3 days, while the Chinese cards probably sit in a postman’s bag still. Shakadang Trail is a very easy one and takes no more than 1 hour to the furthest allowed spot (5D cabin in Dec 2013) and back. It is the most popular one especially by the local or Chinese tourists who seem to prefer more comfortable way of ‘hiking’. Although it is mostly flat and short, the trail itself is quite high up and the views are amazing. Eternal Spring Shrine and Changguang Temple sit almost opposite to the Shakadang trail and a walk from one to another is steep but a scenic one. 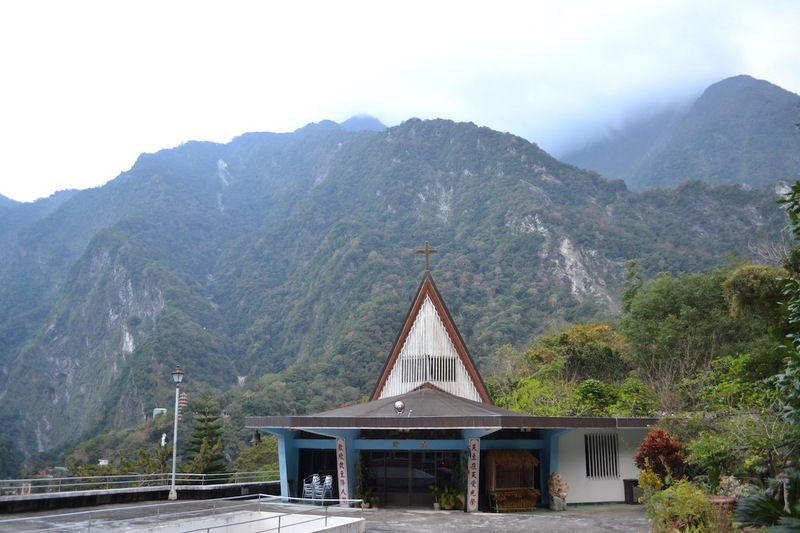 The shrine, which was built as a memorial to the 250 workers who died while building the cross-island highway passing through the national park, is accesible through a series of tunnels carved in a mountain. Above the shrine, a few hundred stairs zigzagging up the hill we reached a buddhist tower with spectacular views of the valley and started our descent to the other side of the mountain. 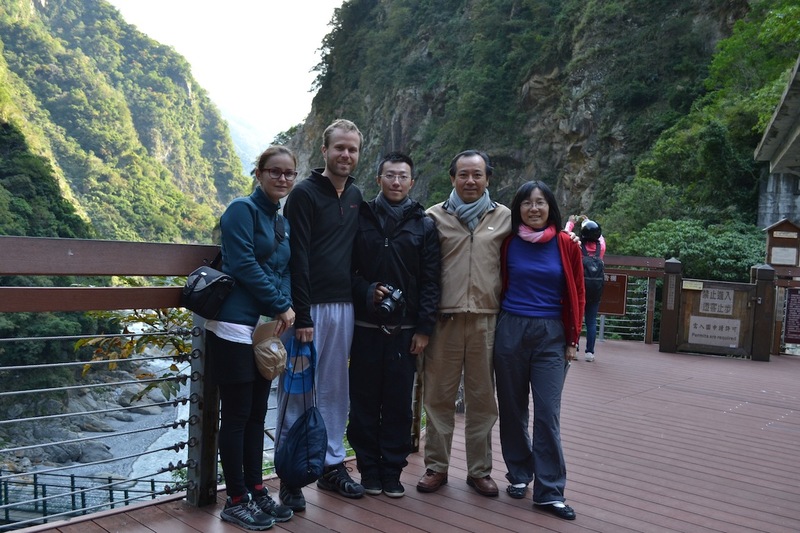 Just before reaching the Changguang Temple there was our first suspension bridge to cross – a big deal for Lucia especially! Focusing ahead on the wooden floor and holding tight onto the railings, we both managed well including some posing for the camera. At the time we were here, the whole trail was completely emtpy due to construction work in a nearby tunnel and no access to cars or tourbuses. Lotus Pond trail was the highlight of our hiking activities in the park. The trail starts with a path carved to a cliff with metal railings missing here and there. Although it is quite wide, Lucia wanted to return even before seeing the first suspension bridge, that was patched up of 2 parts. First one looked ok, almost a meter wide, but surprisingly, the bridge narrows down to two pieces of wood after the first half. Let’s call it a Crying bridge. The path afterwards was not much more encouraging as due to frequent rockfall there were parts covered by piles of stones and earth that had to be climbed over. This would be no issue if there wasn’t a hundred meters drop down to the side. Later we passed a guy who was doing this on a scooter! 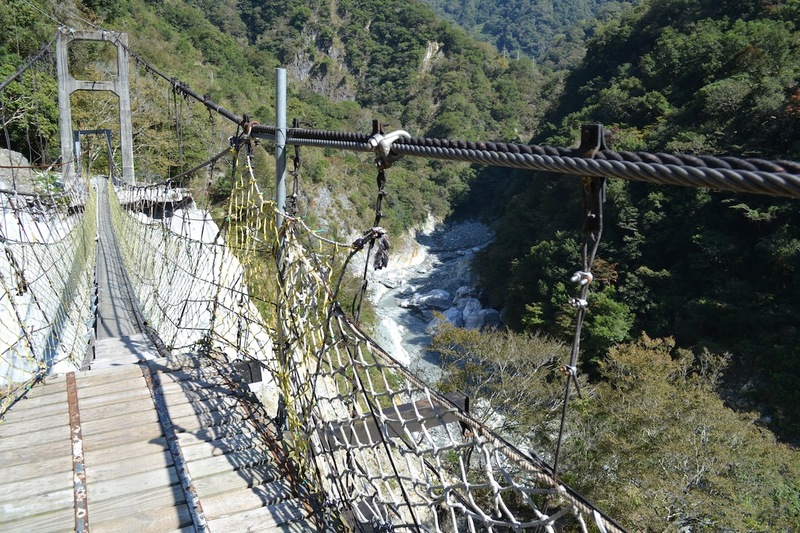 After crossing another suspension bridge – this time no tears involved – we climbed a 2 kilometer path to reach the Lotus pond. The pond itself is nothing spectacular, but we got to see a family of monkeys, a few killer wasps nests (across the park, there are warnings against these along with venomous snakes) and wonderful plants. At the top of the pond there is an abandoned tourist resort with a church, but nothing else. We made our way back through the same trail as we didn’t want to tease the monkeys with our lunch. Wenshan Hot Spring is a boiling hot spring coming out of a crack in a rock flowing through a few manmade pools, getting colder with every following one. At the end it pours into the river that forms the gorge. 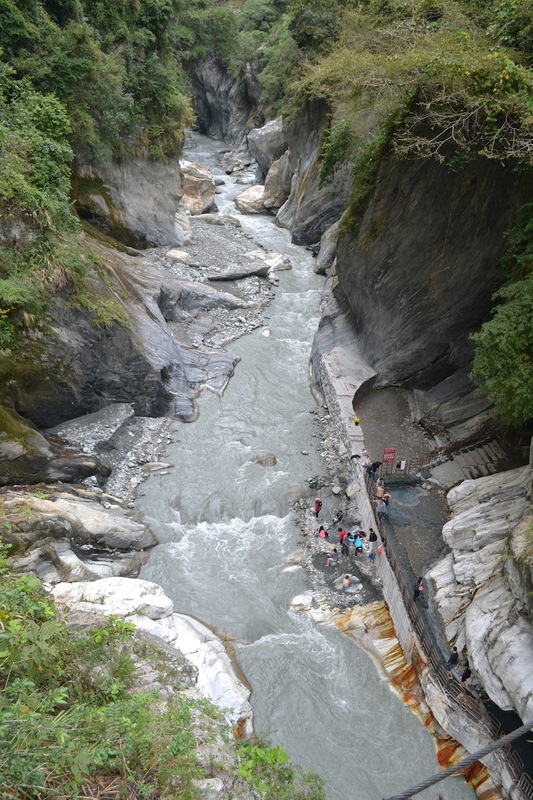 The trail to the spring has – of course – a hanging bridge to cross the river and a couple of steps. There is a changing room, bathroom and shower available too. The spring is closed because of a rockfall threat, but as there were plenty of people already, we joined them too. Lucia just dipped her feet, but Mark went all in. The water was really boiling so it takes time and courage to go for it. Mark conquered the first and the hottest pool together with local oldies who were sitting there as if their skin was made of something stronger. 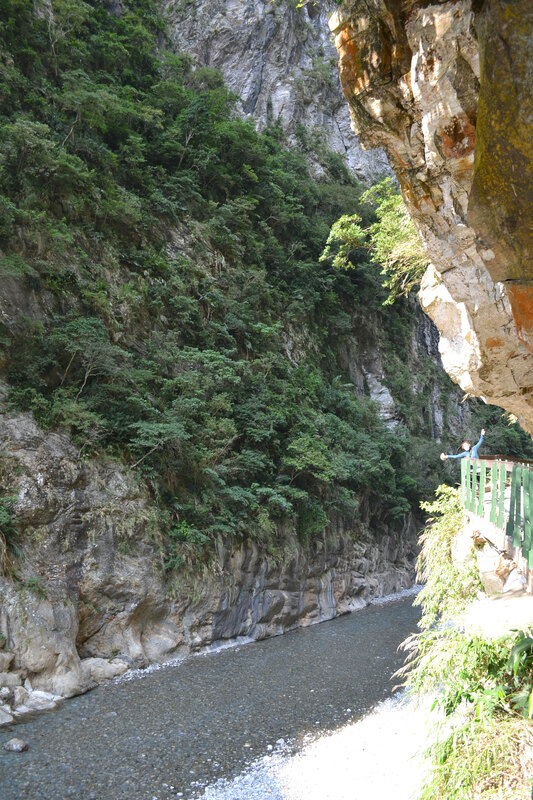 Lushui to Heliu is a short but nice 1 hour long trail that leads through a cliff overlooking the gorge and the main road. Its second part is the original cross-island road built by Japanese. Also here we spotted some monkeys and watched butterflies, which are plenty across the whole island. Although Mark was eager to, we didn’t do any more trails as most of them were closed or seemed to be too tough or dangerous for Lucia. However we managed to explore quite a good part of the park and see a lot from its beauty including the flora and fauna. We mentioned the monkeys, butterflies and wasps, but we also encountered a hog which, luckily, ran away from us. Especially ladies will be interested to know that the whole park is full of plants that we normally grow or let die at home. That includes a Christmas star, that actually grows on a tree! We stayed in a small village of TianXiang (or TianSiang), which – although the biggest one in the area – has only a few accommodation options. We were deciding between the cheapest ones being Protestant church and Catholic church. Being Dutch, Mark felt very strongly about the protestant one, but the catholic double room with shared shower for NT700 won over a great view and homey double ensuite for NT1200 at the protestants. The catholic option had hot water between 6 and 9 pm, good rooftop for excercising and the room itself wasn’t too bad either. On our last day Christmas ornaments including lights, a Merry Xmas sign and a large-sized stable with all the main characters were set up. In Taiwan holidays are coming as well! The town has few food options and one can decide between fancy meals in the five star Silk road hotel, pre-booked and OK meals (buffet breakfast, set lunch and dinner) at the Youth Activity Centre (that has rooms too) or eating at one of the not-so-great ‘restaurants’ at the bus station. We did a mix of all including having the smallest pizza ever in the YAC with approx 15cm diameter. Getting around is a bit of fun in Taroko and as we didn’t have our own car or scooter, we did a combination of the local tourist shuttle bus, that doesn’t go too often, and hitch-hiking for the first time for both of us. It was a pleasant experience, to our surprise, and we were lucky to meet some nice folks, who maybe didn’t speak English perfectly, but were very friendly, helpful and even offered us their snacks to take for our hike (family on the picture). We have a feeling we will do it again! 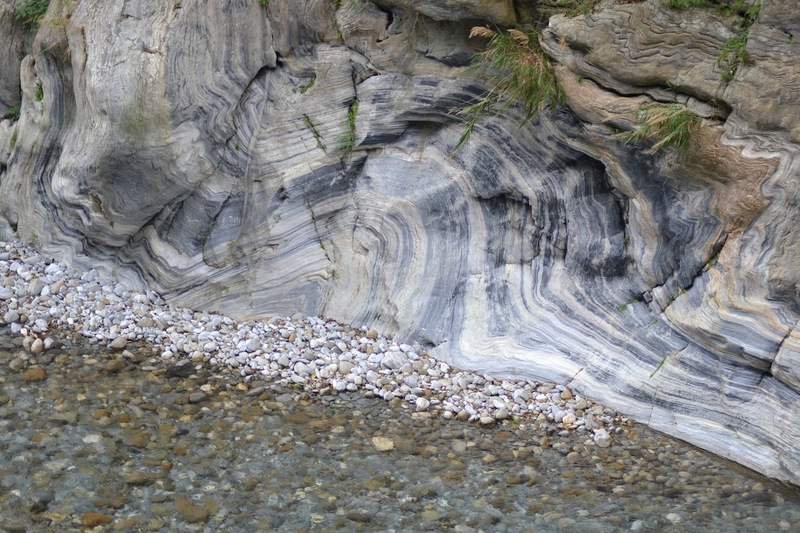 The beauties of Taroko captured on our camera are here. Po niekolkych tyzdnoch presunov z miesta na miesto kazde dva-tri dni sme uz tuzili po kludnom mieste na relax. Ako nam mnohi doporucili, rozhodli sme sa vyrazit z Taipei po vychodnom pobrezi do narodneho parku Taroko. Ocakavali nas kanony s mramorovymi stenami, husta zelen, opice a nejake tie skalnate hory. 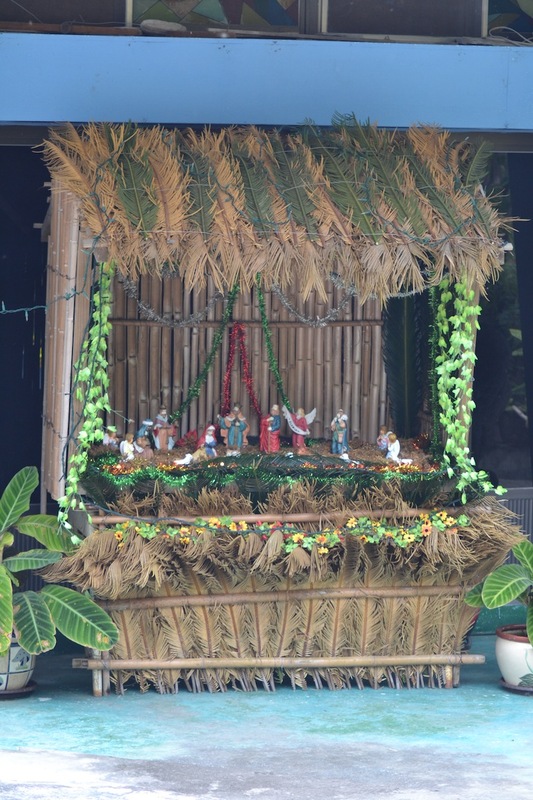 Pred Tarokom sme sa na jednu noc zastavili v pobreznom meste Hualien, ktore vacsinou sluzi ako zakladna pre jednodenne vylety do narodneho parku. Byvali sme v hosteli Chaofu B&B nedalelo vlakovej stanice, kde nas majitelka privitala flaskami vody, susienkami a bananmi. Neskor sme dostali dalsiu vodu, pomarance a luxusne susienky. Tomu hovorime pohostinnost! 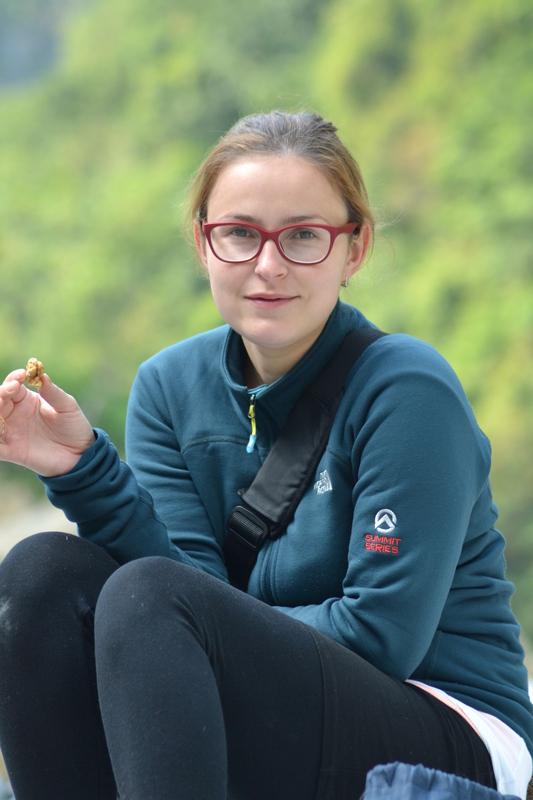 Den v Hualien bol kratky, ale spolu so sladkostami a ovocim sme vyfasovali i dva bicykle a tak sme sa vybrali preskumat cyklisticke chodnicky na pobrezi. Fantasticke cesty, poriadne znacenie a nadherna sceneria nechavala len jednu otazku: ako to na tom Tajvane robia!? Pauzicku sme si dali v starom pristave, v ktorom dnes nasli domov galerie a kaviarne a poslali domov par pohladnic. Ked toto piseme uz vieme, ze jedna dorazila na Slovensko za asi 3 dni, zatialco tie z Ciny este asi sedia u nejakeho postara v taske. Shakadang Trail je jeden z jednoduchych chodnikov a viacmenej prechadzka od zaciatku po posledny povoleny bod a spat (5D cabin v decembri 2013) trva nie viac ako hodinu. Tento chodnik je najpopularnejsi v celom parku, kedze domaci a cinski turisti preferuju pohodlnejsie sposoby turistiky. I ked je takmer cely po rovinke a je kratky, chodnik je dost vysoko polozeny a tak sa i tu mozete nabazit vyhladov na dolinu. Eternal Spring Shrine (chram) a Changguang Temple (klastor) su polozene v kopcoch takmer hned oproti Shakadang chodniku a vystup medzi nimi je sice strmy, ale bohaty na vyhlady. Chram bol postaveny na pocest 250 robotnikov, ktori zahynuli pri vystavbe cesty, ktora pretina narodny park a dostanete sa k nemu cez chodnik a tunely vytesane do skaly. Nad chramom, niekolko stoviek cik-cak schodov do kopca lezi budhisticka veza s vyhladom na dolinu i chram. Odtial je to uz len schodami dole na druhu stranu kopca. Kusok pred klastorom Changguang nas prekvapil visuty most – nas prvy, ktory sme zdolali, co bol velky uspech hlavne pre Lucku! Tajomstvom je sustredit sa na drevenu cesticku pred sebou a pevne sa drzat zabradlia. Zvladli sme to skoro lavou zadnou i s pauzou na pozy pred kamerou. Ked sme tu boli, cela cesta bola ludoprazdna vdaka stavebnym pracam v tuneli pod kopcom, ktory znamenal, ze auta a turisticke autobusy sa sem nedostali. Vylet na Lotus Pond (jazierko) bol asi hlavnym uspechom nasich turistickych aktivit v Taroku. Prva cast chodnika je vytesana v utese s kde-tu chybajucim zeleznym zabradlim. Napriek tomu, ze chodnik je tu celkom siroky, strachopudka Lucia sa chcela vratit a to este ani nevidela visuty most zlatany dohromady z dvoch casti. Prva cast vyzerala fajn, asi meter siroka, ale k nasemu prekvapeniu, most sa po druhej polovici zrazu zuzil a pred nami bolo asi 20 metrov mosta pozostavajuceho (okrem zabradlia) z dvoch latiek. Nazvime tento most ‘mostom Placu’. Chodnik za mostom nebol o nic moc lakavejsi, kedze kvoli popadanym kamenom niektore casti boli zasypane a bolo treba hromadu kamenia prekonat. To by nebol problem, keby vedla nebol 100 metrovy spad. Neskor sme sa minuli s panom, ktory toto vsetko daval na skutri! Po druhom visutom moste – tentokrat bez slz – sme vyslapali 2 km do kopca a dorazili k jazierku. Jazierko samotne nie je nic moc, ale nam sa podarilo spozorovat opice, pocetne hniezda divych vciel (varovanie proti jedovatym vcelam a hadom su po celom parku) a nevidane rastliny. Nad jazierkom je opusteny turisticky rezort aj s kostolom, ale nic ine. Vydali sme sa teda naspat tou istou cestou zatial bez obeda, kedze sa nam nechcelo provokovat opice. Wenshan Hot Spring (horuci pramen) je takmer vriaci pramen vyvierajuci spomedzi skal, ktory preteka niekolkymi umelovytvorenymi kamennymi ‘bazenmi’. Prvy bazen je vriaci, zatialco ten posledny sa da vydrzat. Pramen potom vyteka priamo do rieky. Chodnik veduci k pramenu vedie – ako inac – cez visuty most a potom uz len po schodoch dolu. Na chodniku je i prezliekarna, wc a sprcha. Pramen samotny bol oficialne zatvoreny kvoli padajucim kamenom, ale ked sme videli, kolko ludi sa vymaca, neodolali sme a isli sme sa pridat do casti, ktora bola ochranena. Teda Lucia len po clenky, ale Mark isiel do toho. Voda je fakt vriaca a tak to vyzaduje cas a odvahu, aby sa clovek odhodlal. No a Mark samozrejme dal i ten najhorucejsi bazen v spolocnosti postarsich domacich, ktori tam sedeli, akoby nic. Cesta z Lushui do Heliu je kratka, ale malebna hodinova prechadzka, ktora vedie cez utes ponad dolinu a cestu. Druha cast chodnika vedie po povodnej ceste pretinajucej hornaty stred ostrova, ktoru nechali postavit Japonci. Aj tu sa nam podarilo vidiet opice a pozorovat motyle, ktorych je na celom ostrove neurekom. I ked Mark velmi chcel, nepodarilo sa nam absolvovat viac tur, kedze vacsina boli bud zatvorene, alebo vyzerali byt narocnejsie a nebezpecnejsie, nez sa Lucii pacilo. Napriek tomu sa nam podarilo preskumat dobru cast parku a vidiet vela z jeho kras vratane flory a fauny. Uz sme spominali opice, motyle, osy, ale stretli sme sa i s diviakom, ktory, nastastie, bezal od nas prec. Najma damy bude zaujimat, ze takmer vsetky rastlinky, ktore mate doma v kvetinacoch, tu rastu divoko v prirode. Dokonca i vianocna hviezda, ktora prekvapivo rastie na stromoch! Byvali sme tu v dedinke TianXiang, ktora – i ked je najvacsia v oblasti – ma len malo ubytovacich moznosti. My sme sa rozhodovali medzi najlacnejsimi moznostami: katolickym a protestantskym kostolom. Ako spravny holandan, Mark mal jasnu volbu a tesil sa na noci u bratov protestantov, ale katolicka izba so spolocnou sprchou za 700 tajvanskych dolarov to vyhrala nad sice krasnou izbou s vyhladom a kupelnou u protestantov za 1200. Byvanie u tajvanskych katolikov nebolo spatne: tepla voda medzi 6 a 9 vecer, terasa na streche na cvicenie a mala ale cista izba. V nas posledny den sa rozsvietili i vianocne svetla vratane Jeziskovych jasliciek. Vianoce prichadzaju i na Tajvan! Mestecko ponuka len niekolko stravovacich moznosti a rozhodovat sa mozete medzi 5-hviezdickovym hotelom Silk road, objednanim jedla (bufetove ranajky a obedne ci vecerne menu) v Youth Activity Centre (ktore ma tiez ubytovanie) alebo sa mozete najest v jednej z nie moc lakavych podnikov pri autobusovej zastavke. Nam sa podarilo vyskusat vsetko a dokonca sme tu mali i najmensiu pizzu na svete s priemerom asi 15 cm. Dostat sa z miesta na miesto v Taroku je celkom zabavne a kedze sme nemali vlastne auto ci skuter, kombinovali sme necasty turisticky kyvadlovy autobus so stopovanim, ktore bolo pre nas oboch novinkou. A bola to prekvapivo vcelku prijemna skusenost, kedze sme stretli len samych ochotnych ludi, ktori nam dokonca chceli nechat ich vlastnu svacinku na vylet (rodinka na obrazku). Myslime si, ze to zas niekedy skusime! Vyber fotiek kras Taroka je tu.